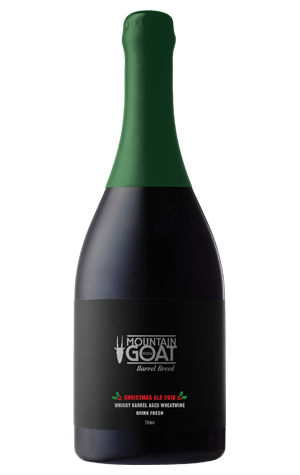 Of all their Barrel Breed releases, the Christmas Ale is the one with which the Goat brewers give themselves the most room for manoeuvre. Sure, they'll tweak the recipe and the barrels-of-choice for their annual Barleywine and Imperial Stout offerings, but given "Christmas Ale" isn't a style as such, they've flitted from Belgian quad through delicate strong golden ale to the 2018 festive fare, which is their first wheatwine; in other words a big beast of a beer built upon a grain bill featuring a large proportion of wheat. When we say "big beast", it's not a phrase chosen lightly. And not just because the finished beer weighs in above 11 percent ABV. If we can get a little technical for a moment, the brewers took the beer to 24 degrees plato (a measure of density), which is really high (OK, so not that technical...). For some context, on a past trip to Belgium – a country that knows a thing or two about big beers – we were told the Stille Nacht from Dolle Brouwers held the record for the highest plato of any beer in the country at 27 degrees. So Goat's is up there. Anyway, once they'd attempted to bring it towards something approaching a dry finish, the brewers popped it into a mix of rye and Tennessee whisky barrels for a month before bottling. And the outcome of all this shenanigans? Aromas are of the oak, vanilla toffee and almond liqueur sort; there's a lovely pillowy yet still textural feel on the palate; flavours are dominated by rich, creamy toffee that try to mask some backend booze. Imagine the Marshmallow Man from Ghostbusters was flavoured with sweet caramel. Then imagine diving into his body as he melts. Uncooked cake batter in boozy beer form.